Mike is all the way past Ophir and heading to where there may or may not be any trail. He's ridden almost 50 miles today, meaning conditions were good. Weather stations are reporting light snow at the moment, with more in the forecast. Up to 2 inches accumulation tonight. Could be adding to already soft conditions. We will know tomorrow as Mike makes his way into it. This is one of the most remote stretches of the route, with no villages for ~100 miles after Ophir. 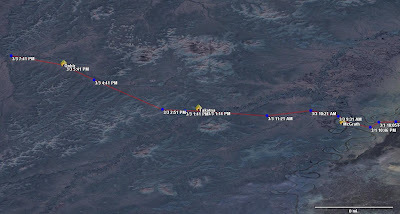 The race website reports that the dog racers should be passing Mike and the racers going to Nome tomorrow, so this should bring more of a trail.